Origin Native to a vast area extending from the Indo-Malayan Archipelago the Philippines and the Moluccas through New Guinea to Western Micronesia. Breadfruit is one of rare fruits which are consumed as a vegetable than as a fruit. Breadfruit is grown all through the tropics and this fruit belongs to the family of “Moraceae” and Genus of “Artocarpus”. It is closely related to the other tropical fruits like jackfruit, breadnut, figs, and mulberries. Texture and smell of breadfruit when cooked, is suggestive of bread, hence the fruit’s common name. The scientific or Latin name of breadfruit is derived from Greek (artos = bread, karpos = fruit), and altilis means ‘fat’. Breadfruit is native to a vast area extending from the Indo-Malayan Archipelago the Philippines and the Moluccas through New Guinea to Western Micronesia. Breadfruit, Breadnut, Breadnut Tree are few of the common names of breadfruit. Seeded breadfruit and seedless breadfruit are two most popular and common varieties of breadfruit that is grown throughout the world. It can be cooked and eaten at all stages of development. 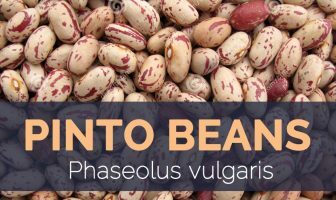 It is typically consumed when mature, but still firm, and is a delicious substitute for any starchy root crop, vegetable, pasta, potato, or rice. 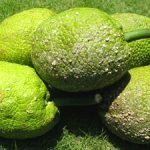 Breadfruit is a large, branch, evergreen canopy perennial tree, 30 m high with a clear trunk to 6 m, a cylindrical bole diameter of 60 cm and rough greyish-brown bark. All parts of the plant yield sticky latex. 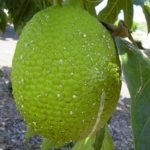 Breadfruit grows well in hot humid tropical conditions and is adaptable to a wide range of soil types from deep, fertile, well-drained soil – sands, sandy-loams, loams, sandy clay loams to sandy coralline soils near the sea and on coralline limestone. Leaves of breadfruit is clustered at end of branches and arranged spirally up the branchlets, on 8–12 cm petiole. Leaf blade 12–59 cm long by 10–47 cm wide, but juvenile leaves often larger, usually deeply pinnately lobed with up to 13 lobes cut from 1/3 to 4/5 of the way to midrib, rarely nearly entire with a praemorse apex, varying in size and shape on the same tree, thickly coriaceous, below pale green, above dark green and glossy, glabrous, to moderately pubescent, juvenile leaves may be densely pubescent, with pale or colorless, rough-walled hairs on midrib, adaxial and abaxial blade. Axillary and solitary, flowers on an unbranched axis (male inflorescences drooping, cylindrical to club-shaped) or flowers arising from a single point (female inflorescences stiffly upright, globose or cylindrical). Male flowers consist of tubular perianth apically 2-lobed, pubescent, lobes lanceolate; anther elliptic. Female flowers consist of tubular perianth, ovoid ovary and along, apically 2-branched style. 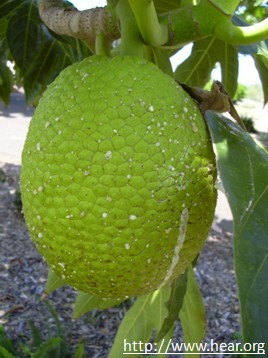 Breadfruit is actually an indehiscent globose, ovoid to cylindrical fruit, 9–29 cm long by 6–20 cm wide. They are normally green while young turning yellowish-brown when ripe and rarely pinkish. Fruit skin range from smooth to rough to spiny which encloses creamy white to pale yellow colored flesh. It has pleasant aromatic smell and fairly sweet taste. An average weight of this fruit is about 1 to 5 kg. Fruit consists of rounded or obovoid, irregularly compressed seeds, 1-3 cm long and with a pale to dark brown seed coat. Fruit are typically mature and ready to cook and eat as a starchy staple in 15-19 weeks. Sweet, creamy flesh can be eaten raw or cooked. Fruit contain zero to many seeds depending upon the variety. 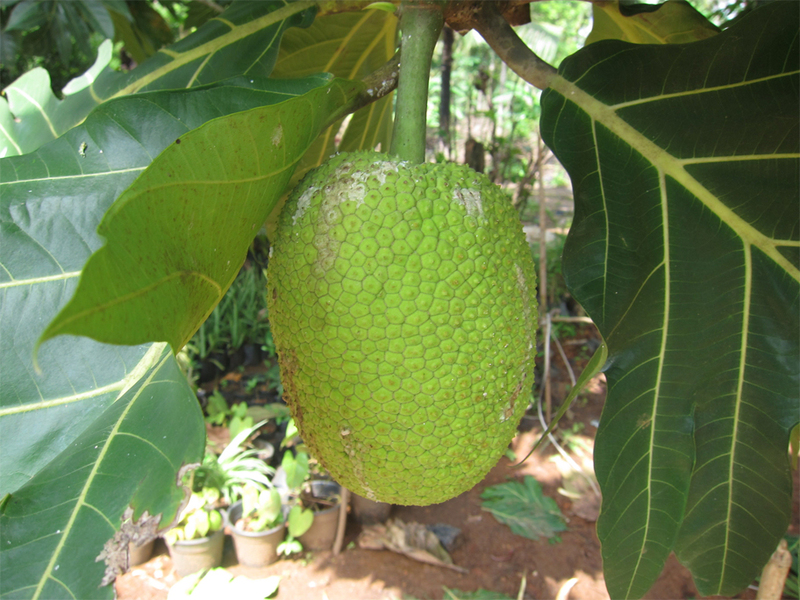 Breadfruit was once used to inexpensively feed slaves, and it has been grown as a staple food due to its versatility, significant energy content, and huge yield capacity. The breadfruit is believed to be native to a vast area extending from the Indo-Malayan Archipelago the Philippines and the Moluccas through New Guinea to Western Micronesia. At least two species (A. camansi and A. mariannensis) and at least two different events (vegetative propagation coupled with human selection in Melanesia and Polynesia, and introgressive hybridization in Micronesia) were involved in the origins of breadfruit. Most Melanesian and Polynesian cultivars appear to have arisen over generations of vegetative propagation and selection from A. camansi. 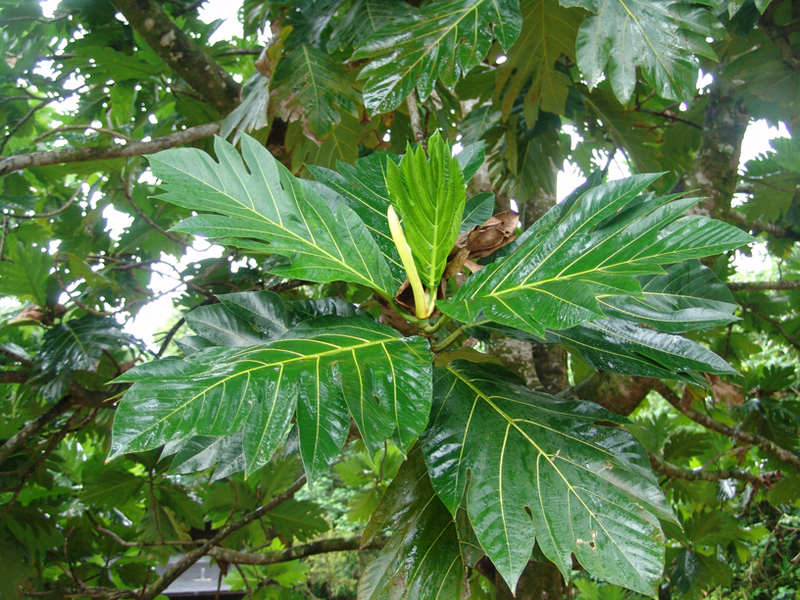 In distinction, most Micronesian breadfruit cultivars appear to be the result of hybridization between A. camansi – derived breadfruit and A. mariannensis. Breadfruit widely planted in tropical Asia and has become a popular staple food crop and profusely planted in garden areas, mature fallow forests, village tree groves, and in home gardens on both high islands and atolls throughout Melanesia, Polynesia, and Micronesia. Today it is grown in some 90 countries throughout South and Southeast Asia, the Pacific Ocean, the Caribbean, Central America and Africa. Apart from their pleasant aromatic smell and fairly sweet taste, breadfruit is a good source of nutrients, vitamins and minerals. Consuming 220 gram of breadfruits offers 63.8 mg of Vitamin C, 59.66 g of Carbohydrate, 10.8 g of Total dietary Fiber, 1078 mg of Potassium, 0.185 mg of Copper, 0.242 mg of Vitamin B1 and 1.005 mg of Vitamin B5. Moreover many Amino acids 0.114 g of Threonine, 0.141 g of Isoleucine, 0.143 g of Leucine, 0.081 g of Lysine, 0.022 g of Methionine, 0.02 g and Cystine are also found in 149 gram of loquats. Breadfruit is packed with nutrients, which helps to lower cholesterol, fight infections, and promote youthful skin and healthy hair. Since it contains good amount of fiber that reduces the rate of glucose absorption, it is a diabetic friendly food. It is full with the heart friendly nutrient potassium that controls blood pressure and heart rate. Breadfruit is an excellent source of potassium. This heart-friendly nutrient helps to reduce blood pressure in the body and controls the heart rate by reducing the effects of sodium. It conducts electrical charges that drive muscular contraction in the skeletal system including the heart. Dietary fiber helps reduce cholesterol by preventing its absorption in the gut. It lowers bad cholesterol (LDL), while elevating good cholesterol (HDL) in the body. It decreases the triglyceride levels, which is one of the main causes of heart attacks. Regular consumption of breadfruit juice gives skin a glowing and youthful appearance. Vitamin C content present in breadfruit helps to promotes collagen production that provides elasticity to skin. Breadfruit inhibits the activity of pro-inflammatory enzymes and avoids overproduction of nitric oxides, therefore preventing skin inflammation. Breadfruit contains a lot of fiber which helps in suppressing impact of diabetes in human body. It is a healthy dish to be consumed if you are a diabetes patient. Fiber takes a lot of energy to digest and thus controls level of energy store, depleting sugar content in blood. Also, by digesting fiber, body will not get much calories (sugars) to store back as it was before digestion and thereby controls diabetes. Breadfruit has been known to help an individual sleep with its high content of magnesium, which is a mineral that is directly associated with improving the quality, duration, and tranquility of sleep. Breadfruit also helps regulate the metabolism, in order to help reduce sleep disorders and the occurrence of insomnia. Fiber in breadfruit flushes out the toxins from the intestine, helping in proper functioning of the bowel and intestines. It avoids digestion-related illnesses like heartburn, acidity, ulcer and gastritis, removing toxic compounds from the gut. Apart from that breadfruit protects the colon’s mucous membrane by warding off cancer-causing chemicals from the colon. To strengthen the bone and to keep it away from diseases, one of the most important nutrients along with calcium is omega fatty acids. 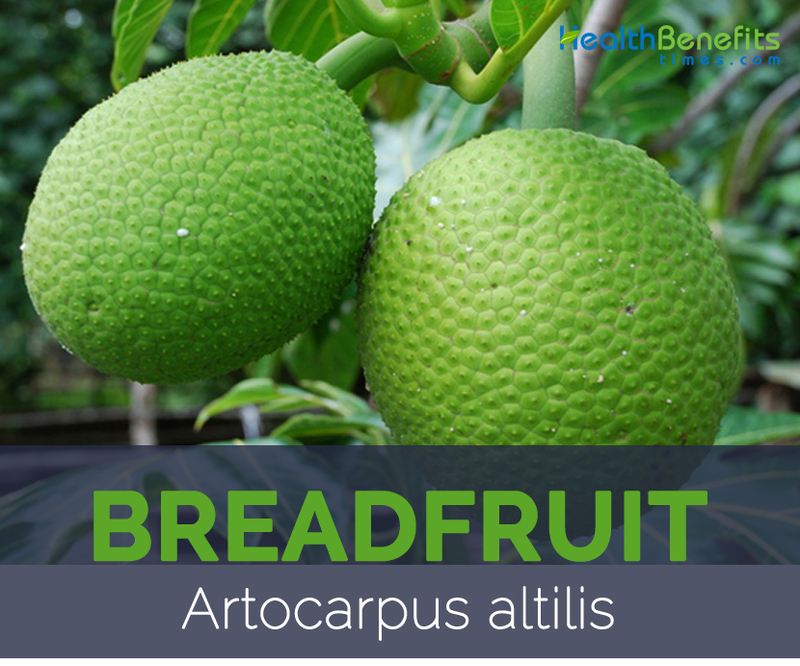 Breadfruit provides the requirement perfectly and ensures that your good bone health is maintained. If you are suffering from toothaches, you have to consume the toasted breadfruit flower. 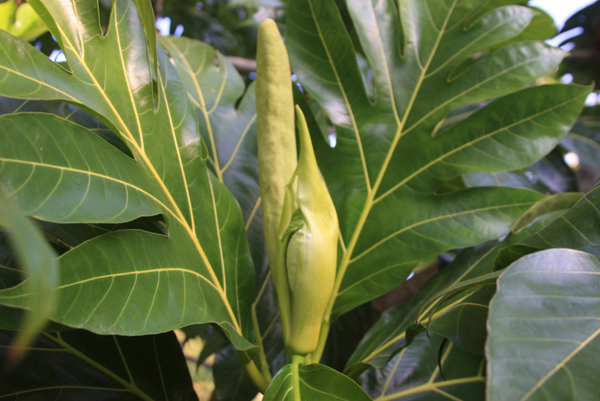 Applying the leaves of the breadfruit on the tongue can also help in curing thrush. Fiber intake of the breadfruit again helps you in feeling full without any intake of calories. This helps in keeping up the energy levels in an effective manner. One feels active without any accumulation of calories or fat in the body. This keeps the cholesterol levels in check and avoids heart diseases. Breadfruit is actually a good source of omega 3 and omega 6 fatty acids, which certainly condition the hair, decreasing hair breakage. The fatty acids present in breadfruit help to regulate the sebum production in the scalp, decreasing dandruff and itchiness. It also prevents scalp inflammation and cell death, preventing hair loss. Breadfruit consists of good amounts of antioxidants that help the body to develop resistance against infectious agents. It also searches harmful free radicals from the body that lead to aging and other age-related diseases. Breadfruit is a main food in Polynesia and Micronesia, and as a supplementary staple in most of Melanesia. Immature and ripe fruit, seeds, young leaves and ripe blossoms are consumed in several parts of the world. Immature, half-ripe and ripe fruit and seeds from ripe fruits are eaten after boiling, roasting, baking or frying. Cooked or raw fruit can also be preserved in pits or by sun-drying. 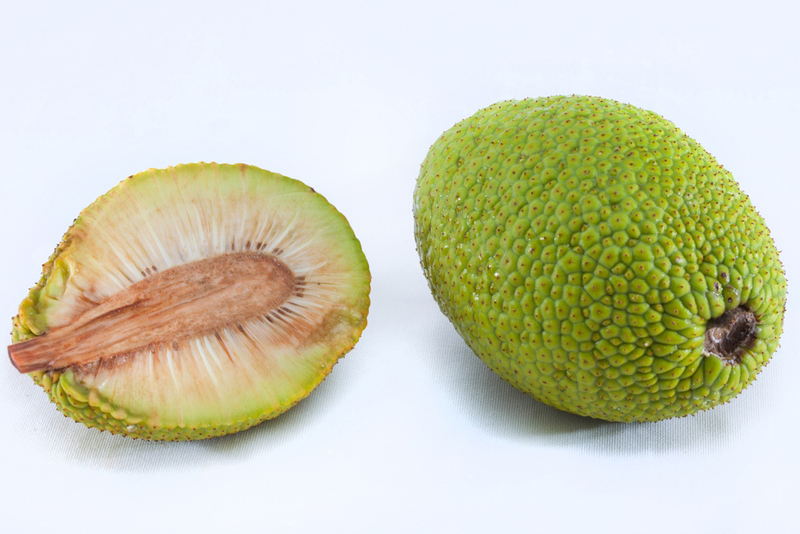 Breadfruit can be commercially dehydrated by tunnel drying or freeze-drying and the waste from these processes constitutes a highly-digestible stock feed. When still firm, breadfruit can be boiled, baked, fried, sautéed, sliced and stir-fried. It can be diced and added to a wide variety of main dishes as is used for potato, yam, taro, sweet potato. It can be made into chips, patties, salads, soups, curries, stews, casseroles, chowder, puddings, buns, breads, dessert and other savory dishes. When half ripe it can be baked or lightly fried in oil. Whole fruits can be cooked in an open fire, then cored and filled with other foods such as coconut milk, sugar and butter, cooked meats, or other fruits. Soft ripe fruit is used in pies, cakes, biscuits, bread, puddings or other dessert. The pulp scraped from soft, ripe breadfruits is combined with coconut milk (not coconut water), salt and sugar and baked to make a pudding. Breadfruit can also be dried, made into flour by pounding or by grinding or frozen to preserve if for later use. Breadfruit can be fermented by burial in layers of leaves in a pit, fermented fruit, mixed with coconut cream and baked into sour bread. Fermented breadfruit mash goes by many names such as mahr, ma, masi, furo, and bwiru, among others. Some popular items are breadfruit fritters consisting of mature fruit, egg, milk powder, chopped onion, bread fruit and fish salad, roast chicken and breadfruit stuffing, breadfruit in beef stew. Another common product is a mixture of cooked or fermented breadfruit mash mixed with coconut milk and baked in banana leaves. Steamed fruit is occasionally sliced, rolled in flour and fried in deep fat. Breadfruit can also candied, or sometimes prepared as a sweet pickle. Firm-ripe fruits are peeled, sliced and fried in syrup or palm sugar until it is crisp and brown in Malaysia. Filipinos enjoy the cooked fruit with coconut and sugar. Under-ripe fruits are diced, boiled, and served with butter and sugar, or salt and pepper, or diced and cooked with other vegetables, bacon and milk as chowder in Hawaii. Breadfruit soup is made by boiling under-ripe chunks of breadfruit in water with cooked salt pork, chopped onion, white pepper and salt, to which is then added milk and butter, and a dash of sherry in Bahamas. Dried fruit has been made into flour and improved methods have been explored in Barbados and Brazil breadfruit flour is used in combination wheat flour in bread making. Breadfruit flour is much richer than wheat flour in lysine and other essential amino acids. Flour is boiled, sweetened, and eaten as porridge for breakfast in Jamaica. Soft or overripe breadfruit is best for making chips and these are being manufactured commercially in Trinidad and Barbados. Some breadfruit is canned in Dominica and Trinidad for shipment to London and New York. 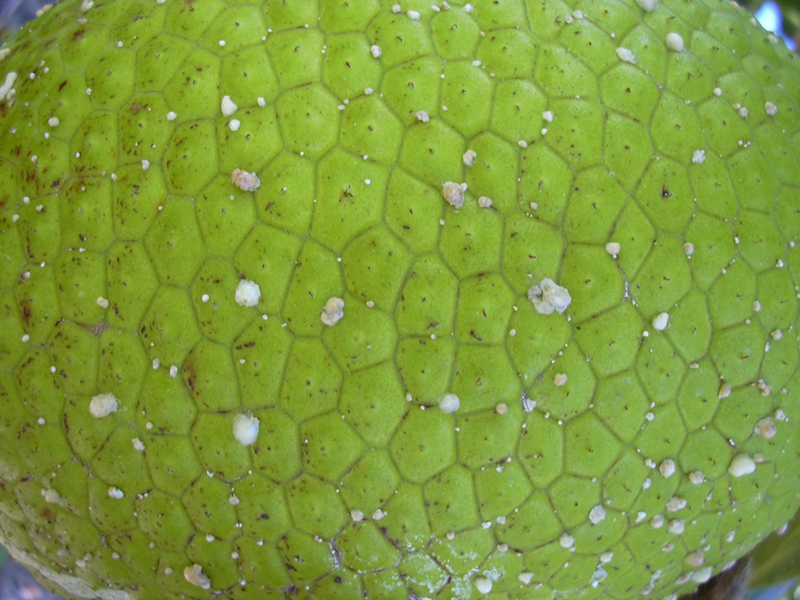 Breadfruit can substitute for taro in poi, resulting in “breadfruit poi” called poi ‘ului in Hawaii. In Puerto Rico, it is called pana or panen which is served with a combination of sautéed bacalao (salted cod fish), olive oil and onions. Breadfruit bread is called buen pan in Dominican Republic. Breadfruit seeds are cooked in salted water, roasted with salt over a fire or in hot coals or baked before eating. They are sometimes made into a puree in West Africa. Cooked seeds are sold by street vendors in Costa Rica. Fallen male flower spikes are boiled, peeled and eaten as vegetables or are candied by recooking, for 2–3 h, in syrup; then rolled in powdered sugar and sundried in Jamaica, Puerto Rico and South Pacific. Young leaves are cooked with coconut cream and salt. Flour made from breadfruit can be combined with wheat flour to make bread. Breadfruit is used in several traditional folk medicines. Breadfruit is laxative and heated fruit slices are used for furuncles in Philippines. Decoction of leaves is used for baths in rheumatism while a decoction of bark is used for dysentery. 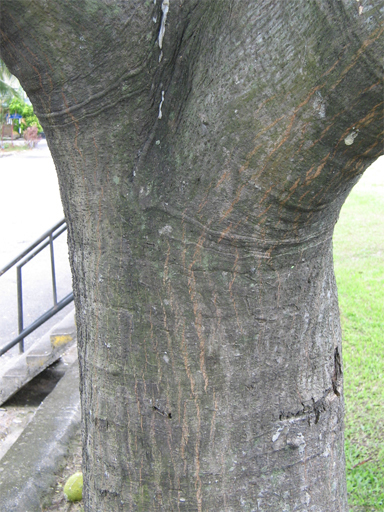 Tree latex is used for hernia in children. Decoction of the breadfruit leaf is believed to lower blood pressure, and is also said to relieve asthma in Trinidad and Bahamas. Crushed leaves are applied on the tongue as a treatment for thrush. Leaf juice is used as eardrops. Ashes of burned leaves are used on skin infections. Powder of roasted leaves is used as a remedy for enlarged spleen. Crushed fruit is poulticed on tumors to “ripen” them. Latex is used on skin diseases and is bandaged on the spine to relieve sciatica. Diluted latex is taken internally to overcome diarrheal. 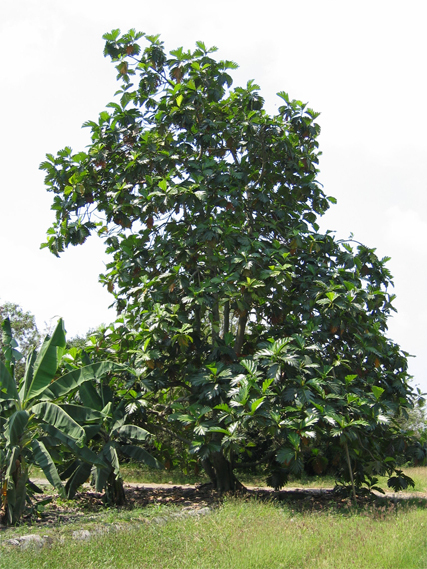 Artocarpus altilis was used for hypertension in ethno medicines of Trinidad and Tobago. Artocarpus altilis roots are used as a component in Thai folk remedies for venereal diseases and cancer. Stems and roots have been used traditionally for the treatment of liver cirrhosis, hypertension, anti-inflammatory, and detoxifying effects in Taiwan. Breadfruit trees are planted as windbreaks, ornamentals and as shade trees in coffee plantations. Wood are valued a source of commercial timber. Wood is resistant to termites and marine worms and used for canoe hulls and occasionally in house construction. Wood is also used for carving statues, bowls and other wooden objects. Inner bark is used to make bark cloth called ‘tapa’. Inner bast fibers are used to make strong cordage used for fishing and animal harnesses in Samoa, Micronesia, and the Philippines. Latex is used for chewing gum, as bird-lime, as seal-lime to prepare wooden surfaces for painting or to caulk boats to make them watertight. Leaves are used for wrapping food for cooking, for parceling of fresh food, and as plates. Dried inflorescences are burnt as a mosquito repellent. Under-ripe fruits are cooked for feeding to pigs. Uncooked soft ripe fruits are used as animal feed. Usually, “wild” variety is grown in certain locations along with seeds as well as very little pulp. 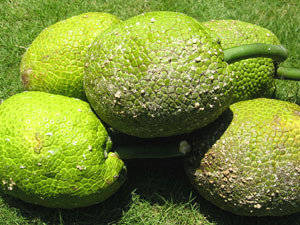 Kamansi or even Seeded Breadfruit is strongly associated with Jackfruit. Both have sharpened points upon its skin. This is extremely abundant with starch. It really is possibly roasted, baked, fried, or even boiled. It really is cooked along with pork as well as coconut milk. It really is offered just like vegetable as well as consumed along with steamed rice as viand. It could also be completed to unripe jackfruit. However it is called as the seedless breadfruit, however from time to time a few completely produced seeds are normally found in generally seedless cultivars. The seeds are usually oblong about 3/4” lengthy, dull-brown along with darker lines. Breadfruit could be consumed uncooked or even cooked. It is really an essential method of obtaining carbohydrates or even “starch” and is also a nutritional choice from time to time, particularly Polynesia. The humid internal pulp of seedless varieties (breadfruit) is consumed right after cooking, and it has the flavor as well as structure of potatoes. 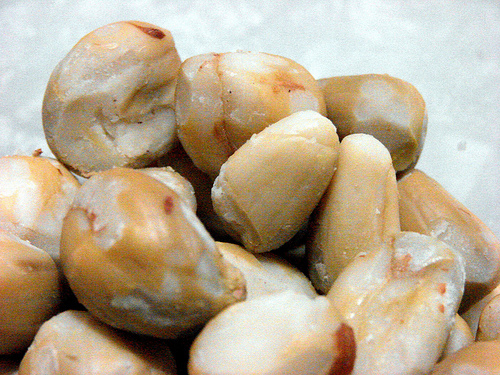 The seeds of the seeded (breadnut) variety may also be cooked (boiled or roasted). In the West Indies a decoction of the leaves can be used to reduce high blood pressure and also to reduce bronchial asthma. The shoots, bark as well as latex also have medicinal purposes. Select breadfruits which are vibrant green, thicker as well as rough, without any bruises or any other blemishes. Keep breadfruit within the fridge as much as 1 week soon after buy. The skin color will certainly darken whilst in the fridge. Each and every fruit possesses its own benefits & demerits. Just like a number of other fresh fruits, breadfruit also offers a tiny demerit. In order to avoid the calories from getting settled within the body tissues, one may well not get this particular breadfruit in the course of night time. Therefore everyone must take just a little care whilst consuming this particular fresh fruit. Cooking breadfruit may appear just like an daunting effort, yet preparing this particular Pacific meals are in fact fairly simple. For those who have dealt with potatoes or even melons in the kitchen area, you will find it simple to learn this particular healthy, tasty as well as versatile fruit. Breadfruit, that features a starchy structure, has elevated levels of vitamin C, dietary fiber as well as potassium, and could be boiled, baked, steamed, grilled or even deep-fried. A couple of recipes provide scrumptious choices for dinner which will certainly make an impression on your friends and family. Cut the breadfruit directly into quarters, lengthwise, and take away the core. Peel off the skin from the breadfruit utilizing a knife since you would a melon or even squash. Dice the peeled breadfruit into half-inch bits. Place the chopped breadfruit right into a big pot of boiling hot water. Boil till sensitive (test as you would a potato), roughly fifteen minutes. Deplete the breadfruit in the colander. Melt the butter in the deeply sauté pan. Add some breadfruit, as well as sauté right up until somewhat golden brown, roughly 5 minutes. Pepper and salt to taste. Offer hot. For a fairly sweet dish, add the cup of brown sugar on the butter within the sauté pan. Place the entire, unpeeled breadfruit straight on to a warm grill. Cover as well as cook up until the skin is smoothly blackened as well as the fruit is sensitive, roughly 1 hour. Make use of a metal skewer to check for tenderness. Make sure to occasionally flip the fruit on the grill to make sure even cooking. If your fruit is performed, take it out of the grill and invite it for cooling. Remove the stem, as well as cut the breadfruit in two. Throw out the core, and place the halves in the short grill-safe dish. Fill the two open cavities using the coconut cream and let the dish capture any kind of overflow. Return the breadfruit halves towards the grill for an additional Ten to fifteen minutes in order that the coconut oil can absorb into the flesh of the fruit. Eliminate the dish through the heat and let it for cooling off. Peel the skin, slice the fruit into bite-size pieces, include pepper and salt, as well as offer hot. 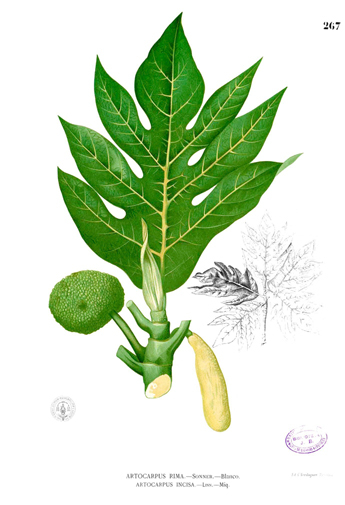 Genus Artocarpus J.R. Forst. & G. Forst. Calories 227 Kcal. Calories from Fat 4.59 Kcal. Calories 191 Kcal. Calories from Fat 50.31 Kcal. Calories 168 Kcal. Calories from Fat 20.7 Kcal.